Having recently been sent a tub of Food Thoughts Fair-trade Cocoa to try, I decided to put it to good use to coincide with a Glutafin Demo I’m doing in Cambridge this month. 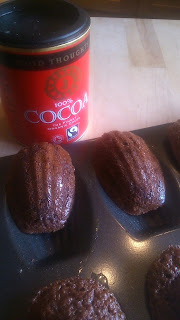 Those who demo will know that you need to demo something that is interesting and relatively quick to do, so I decided on the Madeleine's as they are not something the Coeliac’s or the Gluten Intolerant or Free-from Life-stylers can easily pick up in the shops. So a little about the cocoa, the first thing that struck me was the difference in colour compared to my usual brand of cocoa, this is all down to the process in making it or in Food Thoughts case the lack of it. The Food thoughts Cocoa is not “Dutch Processed” or treated with Acidity Regulator (Potassium Carbonate). This means that the colour is more subtle with hues of reddy brown, rather than a really dark almost black/brown colour. Its pH is also different…For more info on the Dutch method, I suggest you Google it. I walked away from Food Science….. The second difference was the smell, it seems to me to be a lot more rounded in smell compared to my usual brand. When using it I also noted it blended in really well. What also appeals to me is that its Gluten free, I’m mindful of ingredients and generally use GF ingredients where possible to ease of storage and of course any cross contamination. Would I buy it and use it again, yes I would. I’ve also made this recipe Dairy Free as I had some Pure Margarine to use up, for those not Dairy Free, simply substitute with butter. 1. Preheat the oven to 160oC Fan/ Gas 4. Brush the madeleine tray liberally with melted Margarine. 2. Sift together the GF Flour, Baking Powder and Cocoa. 3. Whisk together the eggs and the sugar in a bowl until frothy. Add in the coconut and lightly whisk in. Fold in the GF Flour and the margarine. 4. Carefully add in around a tablespoon of the mix into the prepared tin to just below the rim. 5. Bake for approx. 10 minutes, until the mixture fully cooked through. Leave in the tin for a minute or two then transfer the madeleine’s to a wire rack and leave to cool. I was sent this cocoa to review, all words and thoughts are my own.